Lake home with golf course views too! This very nice Hanover model home has been well maintained and is located in the much sought after gated 55+ golf community of Stone Creek. This lake home has many extras and features 3 bedrooms, 2 baths, 2-car PLUS golf cart Garage, 9 ft ceilings throughout, large neutral tile set on the diagonal in main living areas, wood-look laminate in the bedrooms, 42'' Maple Kitchen cabinets with crown molding and roll outs, granite Kitchen counters, spacious screened Lanai with river rock surface, flagstone patio under pergola, custom closet systems, custom windows treatments, additional storage cabinets, front load washer & dryer on storage stands, and utility sink in the laundry room, professional landscaping, and much more!Upon entering the large Foyer, the Dining Room is to your right. Forward is the Living Room and around to your right is the informal Dining area, and Kitchen with thick granite counters, stainless appliances, large primary pantry and second pantry with roll-outs for full access, and eat-at counter. Large triple and double sliders at the back of the home open and provide direct access to an oversize screened Lanai. The Lanai leads to large flagstone patio, and landscaped back yard with custom raised planter. 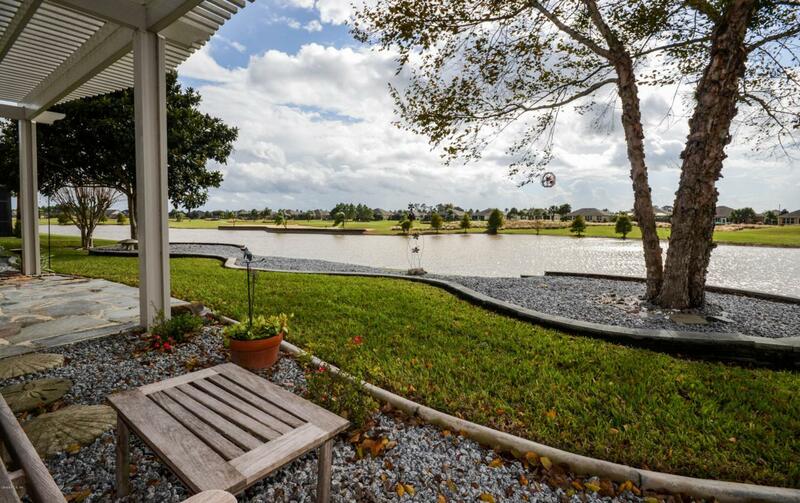 Enjoy spectacular lake views from the back of this home while also enjoying golf course views at a safe distance (tee box, fairway, and cart path are on the far side of the lake). A spacious Master Suite is located at the left back corner of the home, and features a large walk-in closet with multi-level rods, shelves, and organizing drawers, double door access to the large Master Bath with step-in shower, extended Maple vanity with dual sinks, and separate toilet room. Two additional bedrooms, Guest Bath, and Laundry Room are found at the left front of this split bedroom floor plan home.